Personnel tracking power by BLUEFOX TRACKING & GlobalStar. Entirely satellite based. No cell network required. If your business requires sending workers into remote locations, BLUEFOX TRACKING offers peace of mind with full solution deployment to ensure effective communication and safety. Satellite and GPS based devices allow workers to stay in touch and ask for help where cell phone coverage is poor or non-existent - all with the push of a button. The event Notifications screen allows a company to setup users to receive email notifications on button push events from the SPOT3 devices. All events appear in the personnel activity reports as well. Please note that although the system will send email notifications on the push of the SOS button, all SOS events are routed to GEOS as per normal operations of the SPOT devices. Personnel activity reports are also available and provide details on when users have initiated events such as check-in, request help and SOS. 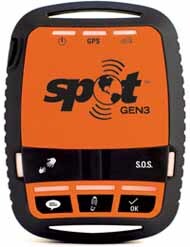 SPOT3 is the latest version of the satellite GPS messenger from Globalstar. Operating on the Globalstar satellite network, this device allows remote (beyond cellular coverage) workers to communicate with safety/logistical teams within their organization. Easy-to-use buttons on the device allow lone-workers to: request 911 services, request basic assistance, check-in with their location and also track their movements for a 24-hour period.